Why choose one of our Centers for a short-term rehabilitation visit? 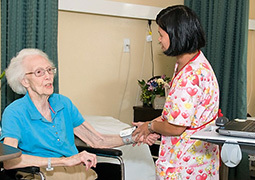 Mission Care Group centers have redesigned the transitional rehabilitation experience with a full spectrum Rapid Recovery Rehabilitation unit in each facility. This provides the perfect location for patients to recover their strength, get well and get home. To obtain a printable checklist to take with you on a visit, click here.